JapaneseWall 禅壁ブログ: Can Jwall be Applied in Bathrooms? Can Jwall be Applied in Bathrooms? Actually there has been a myth of whether it is safe to apply Jwall in bathrooms. 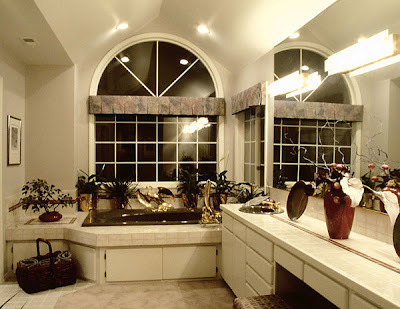 In many places, there is a distinction between toilet, rest room, powder room and bathrooms. In the U.S. most people would identify the term "bathroom" with "toilet" as the two are usually attached. Depending on the type of bathroom you have, we would recommend not to apply Jwall in tiny bathrooms with little ventilation, and where vapors, steam and moisture quickly emerge after shower. Although some of the Jwall series are water resistant, like Kyoto Exterior, Pink Coat, Tenkou, etc, on the safe side, it is not recommended for small bathrooms attaching with showers, so to prevent any peeling or the growth of mold in the long run, if any at all, especially if the underlying surface had not been treated properly and the room ventilation is not good. Diatomite based materials such as Wabi, Noiseless, Siltouch Cork, Ayaka and Kaitei would be good in the toilets, as they have deodorizing properties. In short, all Jwall series are perfect for all drier areas may it be toilets, rest rooms, powder room or waiting rooms. You will be the best judge on how your bathroom is used before deciding the type of wall decor. If you are certain that your bathroom which is attached with the toilet/ powder room is well ventilated, then it should be safe to apply Jwall.